US military officials have defended the use of air strikes in Afghanistan, amid increasing criticism about the numbers of civilians killed as a result of aerial bombing. BBC Afghanistan correspondent Ian Pannell, granted rare access to the main US Air Force targeting base at an undisclosed location in the Middle East, spent a day looking at how decisions are made about where to attack and when. It is the centre of gravity for all air operations in Iraq and Afghanistan. It is home to some 8,000 military personnel. We are told that we are the first foreign journalists to be allowed inside the top secret operations room, but we are not allowed to say where we are or take any recording equipment inside. "It is frustrating because we take a large effort to avoid civilian casualties," says Col Gary Brown, the judge advocate for the US Air Force Combined Air and Space Operations Centre. There are hundreds of people working around-the-clock to draw up the "air-tasking order". This is the master-list for the day's operations. 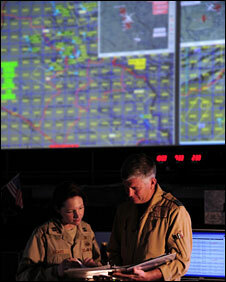 Some 300 missions are controlled from here every day, including air strikes against the Taliban. Unfortunately, sometimes the target is missed. 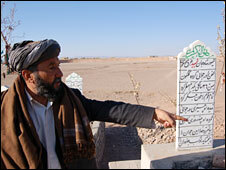 Thousands of innocent people have died in Afghanistan since the US-led war in 2001. 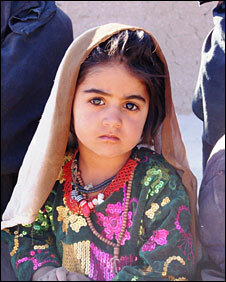 The vast majority have been at the hands of the Taleban. But Human Rights Watch has reported that in the past three years, civilian deaths from US and Nato air-strikes have tripled. Most of these deaths arise not from pre-planned operations but from rapid responses to incidents on the ground, usually clashes with the insurgents. We were given a guided tour of the top secret "combat operations room". We watched clear images from drones flying hundreds of miles away over remote parts of Afghanistan. Giant screens track the movement of planes supporting US troops in action. We were allowed in because America wants to defend its record, to show how much effort goes into minimising casualties. Col Brown says air power is one of America's great asymmetric advantages but bemoans the Taleban's use of the media, what he calls "their asymmetric advantage". Every civilian casualty at the hands of the US or Nato generates headlines and angry statements in Afghanistan. Every incident makes the task of the government and the coalition harder. Now American military officials are accusing the Taleban of deliberately increasing the risk of civilian casualties. Col Eric Holdaway, director of intelligence, says there is clearly documented evidence that "some of our enemies have clearly located themselves amongst civilian populations or [have] moved into buildings occupied by civilians and increased the risk to those civilians". We travelled to a village in Shindand, a remote part of Afghanistan, which was the scene of the worst case of civilian casualties this year. Back in August, US planes attacked an alleged Taleban leader here. Locals say 90 people died. An investigation by the United Nations supported their claim. The US originally said there were just seven deaths but after video evidence emerged that contradicted that, an investigation was carried out. It concluded there were 33 deaths, still far-short of the number claimed by the villagers. Everyone we met had lost someone. Hama, an angelic-looking three-year-old girl sat among a group of grieving grandmothers. She lost both her parents in the air strike. We met Karzai, a six-year-old boy, named after the Afghan president, who lost a brother and his mother. Three months after the attack, the grief and pain at what happened is still raw. What has made it worse is that there has been no compensation for the lives and homes destroyed here, despite promises by visiting US and Nato officials. Hajji Gul Ahmed, a tribal leader, says: "This area was improving but this has made a lot of problems for us. "When the Americans leave this country, we want them to have a good name but instead they will have a bad name because they came here and killed our people." The US has apologised for what happened but its investigation concluded that the attack was justified and that the correct "rules of engagement" were followed. If that is the case, then more innocent people will almost certainly die in Afghanistan.